The University of Winnipeg Wesmen is sad to announce that long time Women’s Basketball Team Manager Jim Schrofel passed away suddenly on Tuesday, January 20th, 2015. For the past 19 years his greatest joy was working with the Wesmen Women’s Basketball team, serving in the capacity of team manager. In the 19 years with the team Schrofel had the honour to work with 104 players and 20 members of the coaching staff. One member of the coaching staff who knew Jim the longest is head coach Tanya McKay. Jim served as team manager with McKay for five years at Silver Heights Collegiate and when McKay was hired as the University of Winnipeg’s Women’s Basketball head coach in 1995, Schrofel was asked to make the move also and the rest is history. “Jim has been with me my entire coaching career. He was my right hand guy. My buddy. Words cannot express what he meant to me and our entire Wesmen Program. Jim will be greatly missed and never forgotten”, added Tanya McKay. Jim’s biggest thrill was being around the players at practice and each and every home game. His positive attitude was shared by all the players who looked to Jim for a smile or a simple high five before every game. “Jim will never know how many lives he touched, simply by just opening a door, giving someone a high five, cracking a smile even when my jokes were not funny. Jim was the glue to our team, there was not a single part of him that did not bleed Wesmen red. This year your Wesmen family plays for you Jimbo. We all love and miss you”, said fifth year team captain Stephanie Kleysen. A memorial service will be held on Tuesday, January 27, 2015 at 11:00 a.m. at Blessed John XXIII Parish, 3390 Portage Avenue. 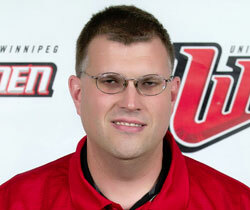 A Jim Schrofel Scholarship Fund will be created to help the University of Winnipeg Wesmen Women’s Basketball Program.